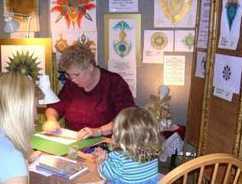 A leading proponent of Creative Mandalas and the Power of Voice, Helen has been working in the development of human understanding for nearly 30 years. She trained as an opera singer at the University of Toronto and the London Opera Centre, touring England as a professional Opera Singer. She taught the Power of Voice, while working as a Therapist/ Healer for 12 years at Bangor, Northern Ireland, before relocating to South Australia. She became interested in Sacred Geometry, healing a difficult situation in her own life and formulating a process of creating mandalas, encompassing her knowledge of voice, into her Soul Mastery Course. Helen has been offering her mandalas as a way of healing the separation from self and a form of enlightenment for 9 years. Mandalas have been employed in spiritual practices and created as ritual art objects for millennia. 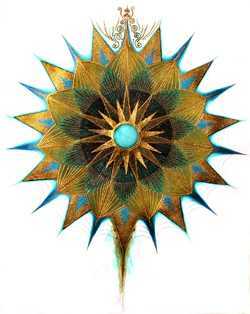 You will have noticed the marvellous mandalas on the entry pages to each of our Sun Sign sectors. These mandalas (energetic spiritual doorways) were created by Helen Grant-Johnston, who has been working with mandalas for many years now. The word Mandala comes from the ancient classical Indian language Sanskrit. It means "circle", but a mandala is far more than a simple shape. It represents wholeness, and in its simplicity reveals the model which organizes the structure of life itself—a cosmic configuration or diagram that reminds us of our relation to the infinite. This world, hidden deep in the unconsciousness of humanity, extends beyond our limited perspective to the outside world of infinity—to the All that Is. As we in the western world begin to understand what Eastern religions have long embraced, we can create a change in how we see ourselves and our planet, and begin to discover our own life purpose. My mandalas are created to assist this opening of the mind. They stimulate an awareness of a greater potential of self and our place in the scheme of things. The more we are able to recognize the pattern of the mandala, the more we are able to live our lives in harmony, connected to the world around us. This quote is from Bailey Cunningham's excellent book Mandala, Journey to the Centre. A mandala is a primal pattern based on the circle that has existed in nature since the beginning of time. This primal patterning can be easily understood when viewed through a kaleidoscope. All the patterns we see within the kaleidoscope appear and disappear, but are all connected. All the pieces are eternally expanding and growing from its center, while simultaneously contracting and returning to its core. At the centre, the geometrical point, is the potential of creation. The circle then becomes the reflection of the center, when one places a compass on a piece of paper pivoting it around that central point to become a circle of infinite points. It is from the circle that we are able to create all shapes. Oneness (the circle) is the principal that creates the foundation of geometry. The “point” of our very existence becomes possible through mandala, the geometrical configurations held within the mandala unlocking our understanding of the infinite patterns held within our cellular memory—our DNA. When we understand the profundity of the information contained within our cells, waiting to be unlocked by the expansion of our minds, we begin to understand that knowing how to unlock this information is paramount in the understanding of our existence as humans. We have personal and collective divine possibilities. Only conscious awareness makes it possible to grasp our primal origins. Throughout my life I have, to the best of my awareness and ability, searched for the truths of life. Only now, through my use of Sacred Geometry and in the creating of my mandalas, have I begun to tap into the vastness of the possibilities creating mandalas has offered me. With humility I offer to create a sacred space with my mandalas for those interested in connecting with themselves in ways made possible with the use of spiritual integrity, sacred geometry and the intent to create such a space that is conducive to individuation and the path to the Self. I have a basic need to express and share as I am guided with others. My work elevates me to a state of bliss and higher consciousness—universal heartspace—which begs to be shared in the most practical way. For the past 10 years I have been developing my craft, offering my unique, individually hand-painted mandalas in whichever way seems most appropriate. I am always surprised at the results and how well the mandalas fit the situation of the person involved, resulting in profound and exciting life-changing transitions (the feedback from satisfied clients confirms this). By creating a mandala for my workshops and Soul Mastery courses I create a space in which the participants can themselves create and develop their skills using sacred geometry in a safe environment conducive to their highest development. 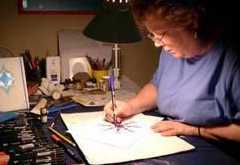 The initial intent when requesting a mandala be created is crucially important. The responsibility lies with the person making the request. I am but the “scribe,” creating on their behalf, making the connections to lost or sleeping parts lying in the unconscious waiting to be reclaimed to make this transition. Color, in itself, is another language involved in creating mandalas. The colors chosen for the mandala are purely intuitive, allowing self-expression and release to the core of your being, of the feelings and emotions involved. Interpretation and reactions are unique to each individual. Just as the mandala is uniquely created for the opening to transformation a mandala can bring, offering infinite possibilities, enhancing your potential to create without limitation.